Your log home has gone several years without care. Now you may be seeing the signs of age including discoloration and fading. The best thing to do is a complete exterior cleaning to remove all the graying, mold, and mildew to see what the wood underneath looks like. Once the home is cleaned you will be able to see if your home needs log repair, log sealing, chinking repair, or even log replacement. Exterior surfaces of log homes are a settling ground for dust, pollen and airborne contaminants that dull surfaces and provide fuel for fungal growth. Cleaning is also needed to perform an adequate inspection of the condition of your exterior finish. Without a thorough cleaning your home may not be in as good repair as you hope. 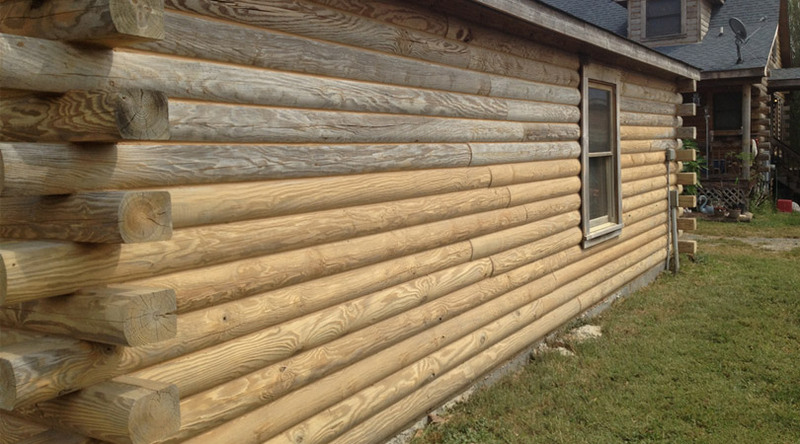 It is important to clean the exterior of a log home with light, low-pressure washing that produces less than 1,000 PSI. A conventional 4,000 PSI pressure washing machine could damage your home and uses more power than needed. Careful consideration is needed to avoid damaging the wood fibers or leaking water into your home. Appropriate chemical cleaners can be used to remove dirt, grime, mold and mildew. Once the cleaners are used the exterior of the home must be completely rinsed to remove any residual chemicals that could cause damage if left. Proper drying time should always be a consideration to ensure moisture is not trapped, and to prevent mold and mildew problems. Finally a deep penetrating borate preservative is applied to protect your home from log rot, fungus, and insect infestation damage.